Mary Burton was born on 19 January 1940 in Buenos Aires, Argentina. One of three children of Molly and Peter Ingouville, Burton and her family moved around in a few small towns in Argentina, due to her father’s business. The family moved to Brazil when her father was transferred there in 1952. She attended schools in Argentina,Brazil,Switzerland and France,trained as a journailst and in 1959 went to work for weekly Times of Brazil.The family settled in Brazil and Burton went to study at the Northlands School which catered for English speaking children. in 1958, Burton went on a skiing trip in Austria, where she met her South African husband Geoffrey Burton.The couple married in Brazil and soon after moved to South Africa. Burton experienced a culture shock in her first few years in South Africa. It was hard for her to process the apartheid system and its policies. She has recounted in interviews how, at first, she just observed how the system worked. After a while, Burton could not just simply watch and disapprove in silence, she decided to do something.In 1961 she married Geoff Burton.she was chairof the organization's Western Cape regional council from 1974 to 1986 but in between 1979 and 1982 she enrolled full-time at University of Cape Town for bachelor's degree. Burton started soup kitchens in poor Black areas, but eventually she began to feel that even that was not enough. This is when she became involved in the Black Sash in 1965. Black Sash was an anti-apartheid organisation that comprised of mostly White middle class women. The apartheid government and most White people were against the organisation, and felt very threatened by it. Things became even harder for the organisation in the 1970s with the emergence of the Black Consciousness Movement (BCM). With BCM emerged a sense of black pride and a belief that only Black people can bring about their own freedom. This meant that the Black Sash would begin to experience some resistance from some Black people as well. Despite the odds, the organisation continued and became quite successful in its endeavours. Burton became president of the Black Sash from 1980s and a commissioner of the Truth and Reconciliation Commission in the 1990s. In 1990 she handed over the presidency to Jenny de Tolly,but again as head of the organization in 1994 to 1995.After the democratic elections in 1994, Burton was elected to become one of 17 people to sit on the Truth and Reconciliation Commission (TRC). 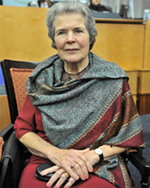 It took two and a half years for the Commission to conclude and hand over the reports to then President Nelson Mandela.Burton has since come up with the idea of a Register of Reconciliation for all the people who could not be heard by the Truth and Reconciliation Commission (TRC) to share their experiences about the transition.In 2000, she helped launch the Home for All Campaign, a campaign that encourages White South Africans to contribute to reconciliation. Burton currently serves as Deputy Chairperson of the Council of the University of Cape Town. In 2011, she was awarded Civic Honours by the City of Cape Town for her contribution to the liberation struggle and national reconciliation.